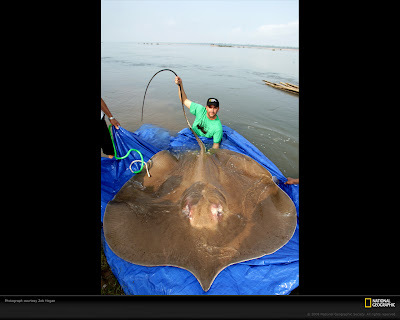 The Giant Stingray or Himantura chaophraya is one of the largest freshwater fish in the world. 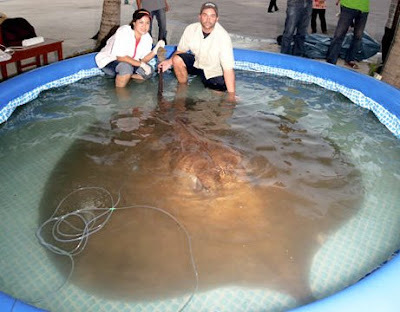 Also known as the Whip Ray, this massive stingray can grow to 16.5 ft (5m) and weigh in at an amazing 1,320 lbs (600 kg)! They are gray or brown in color and shaped like most other stingrays with a flat body and a long tail with a stinger on it. This stinger can reach lengths of 15 inches (38 centimeters) and can easily pierce through human skin and bone. If that didn't freak you out yet consider the fact that their stingers are also often venomous! The monster Giant freshwater stingray pictured above was caught by Ian Weolch whilst fishing with the Fishsiam Ltd team in Thailand. I'm gonna spend several hours in here.